Jeff Steinhauer stands with a machine capable of simulating black-hole conditions in the laboratory. Are black holes truly black? A new laboratory experiment points toward "no." Using a simulated black hole made from soundwaves, scientists have observed a phenomenon known as Hawking radiation: a faint energy emission that, in theory, is created right at the edge of a black hole's event horizon, or the point beyond which even light cannot escape. 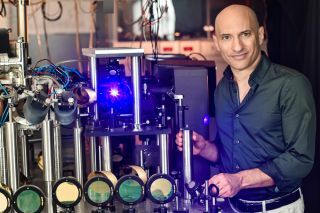 Jeff Steinhauer, an experimental physicist at the Technion — Israel Institute of Technology in Israel, and lead author on the new study, told Space.com. According to Steinhauer, earlier calculations by cosmologist Stephen Hawking (who came up with the theory that bears his name) combined the theories of quantum physics and gravity. The current experiment tests those calculations, providing the first strong evidence that they are correct, Steinhauer said. "A black hole is a testing ground for the laws of physics," Steinhauer said. There's a tricky concept in physics that says that pairs of particles constantly blink into existence throughout space. One is a particle of normal matter and the other is its exact opposite, or antiparticle, so the two annihilate one another, and there's no change to the universe's energy balance sheet. These are called virtual particles. When this happens near the edge, or event horizon, of a black hole, the particles can avoid complete destruction; one can fall inside while the other escapes. But observing such interactions in nature has remained difficult, the Hawking radiation around a black hole (if it exists) is so faint that it can't be seen from Earth around known black holes (most of which are very far away). In addition to the distance, the Hawking radiation is likely overwhelmed by radiation from other sources, Steinhauer said. "It makes it seemingly almost impossible to see this very slight radiation coming from the black hole," he said. The same problem applies in a laboratory, where any heat can create background radiation that overwhelms the lab-produced Hawking radiation. To eliminate that problem, Steinhauer's experiment ran at less than a billionth of a degree above absolute zero. In the analogue black hole, a line of cold rubidium atoms stream from a laser to create a form of matter known as a Bose-Einstein condensate. The cold gas flows faster than the speed of sound in one direction, so that a sound wave trying to go against the flow can't manage to move forward. In this respect, the slower moving sound wave is like a particle trying to escape from a black hole. "It's like trying to swim against the river," Steinhauer said. "If the river is going faster than you can swim, you go backwards, even though you feel like you're going forward." The upstream attempt is analogous to light in a black hole trying to escape, he said. Sound waves trying to move forward instead fall backward. If two virtual particles were created near the edge of the event horizon, one particle could be consumed by the black hole (the fast-moving stream), while the other escapes, avoiding destruction. The escaping particles are called Hawking radiation. A method of creating a black hole using sound waves was proposed in 1981, and since then scientists have struggled to simulate Hawking radiation in the lab. Two years ago, Steinhauer performed an experiment that measured Hawking radiation after something was deliberately crashed into the event horizon of the analogue black hole. This new experiment took more of a wait-and-see stance, waiting for the particle-antiparticle pair to appear without external stimulation, more like what happens in the depths of space. Just as Hawking theorized, the simulated black hole spit out the predicted particles, a sign of Hawking radiation. "What I saw suggests that a real black hole might emit something," Steinhauer said. The new finding also has larger implications for the field of physics, he said. One of the biggest mysteries in physics is why Einstein's theory of gravity (which describes large-scale interactions in the universe) doesn't seem to be compatible with quantum mechanics (which describes very small-scale interactions). "Combining gravity with quantum physics is one of the main goals of physics today," Steinhauer said. "Hawking made the first steps toward that." The simulated black hole tested Hawking's equations. "His calculations predicted there should be light from a black hole," Steinhauer said. "It turns out his calculations were correct." One intriguing result of the artificial black hole involved insight into the information paradox. According to Einstein's theory of general relativity, everything that crosses the event horizon of a black hole is consumed, including information. As the escaping particle steals energy from a black hole, the massive object can shrink over time, eventually evaporating into nothing. Of course, this assumes it has stopped consuming nearby material and thus isn't putting on new weight. Theoretically, a black hole can shrink into nothing, taking with it the information carried by or about the particles it consumed. "Information has vanished," he said. "It's like it goes into the black hole and disappears." Since quantum mechanics suggests that information can't be lost, that raises a paradox. According to Hawking's calculations, the surviving particles contain no useful information about how the black hole formed and what it consumed, suggesting that information vanished with the black hole itself. Steinhauer's black hole revealed that the higher energy particle pairs remained entangled, even after one was swallowed by the event horizon. Entangled particles are able to share information instantaneously, even when they are separated by great distances, a phenomenon sometimes described as "spooky action at a distance." "Some of the solutions to this [paradox] probably rely on entanglement," Steinhauer said. Scientists not associated with the research who were interviewed by Nature News and Physics World both said that while the experiment appears to have measured Hawking radiation, it does not necessarily prove that Hawking radiation exists around black holes in space. The research was published online in the journal Nature Physics.